Here's what we trust to put all this expensive equipment high up in the air. A sturdy roller stand is essential when working with large modifiers in a studio (and even on location!) -- they allow you to move your large modifiers around the set quickly and effortlessly. We use the 14' "High Roller" stand because of its load-bearing capability, but they do make a "Junior Roller" (see below) that extends up to 8.8' for lighter loads. We're a fan of Kupo grip equipment for their affordability and quality. Also known as the "Baby Roller", the Junior Roller stands tall enough for most location applications where we need to be mobile, and offers the same support and stability as a C-stand, with the option to roll it around the location. We prefer the baby roller to C-stands when we mount larger and heavier modifiers like the Para88 or Para133. While not the first to create stackable light stands, Kupo has improved on the original Manfrotto design by allowing their "Click" series of light stands to stack both horizontally (side-by-side) and vertically (stacked), and offering them at a lower price point. Kupo also offers these stands in a 7' size with a smaller collapsed size (36" vs 28") if you don't need the height, or if you'll be travelling with your stands frequently. A C-stand is a C-stand. They're known for being bulletproof and for holding their value extremely well. They're sturdy, can handle a lot of weight, and almost never break. We like Matthews stands because they're based in here in SoCal (Burbank), so getting them fixed or replaced is much less of a hassle. Kupo and Avenger C-Stands with the turtle base are also great -- due to their design, they can be fully disassembled for easy transport. 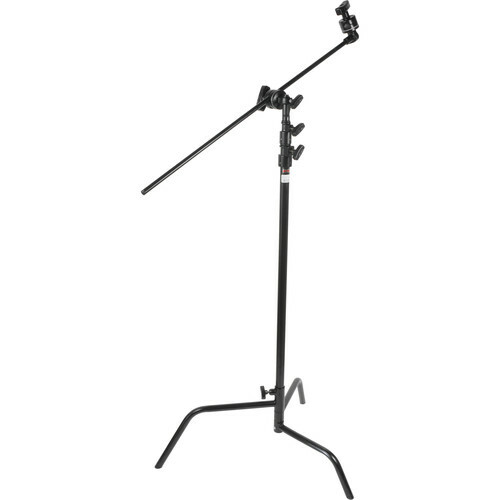 The Kupo Runway Stand base is a great piece of equipment that runs any standard turtle base C-stand column into a roller, and has proven to be very sturdy. We've suspended our Para 133 on a C-stand column with minimal sandbagging, and it's still very sturdy, while offering a very small footprint (smaller than the junior roller) in tight spaces. Additionally, this can turn a 20" C-stand column into a mobile tethering station paired with some Tethertools goodies. We've owned a couple of these for a while, and they're great stands. The locking collar on the Giottos makes them very quick to deploy and are very sturdy. at 10.7', the LC325s fit the bill when we need a taller stand than our 8' Kupo's, but not necessarily the stability or where there's not enough space for a C-stand. An inexpensive and reliable solution to mounting a monitor on a stand. We use these to mount monitors in-studio for tethered shooting. They feature both 75x75 and 100x100 VESA-standard mounting holes and a 5/8" baby pin receiver. Another local SoCal company (Burbank), Stufft makes some nice, durable nylon shot and sandbags. While more expensive, we prefer shot bags to sandbags for their density, meaning the same weight in a smaller size, allowing us to weigh down light stands and other grip equipment in a smaller package.